Bed charges are calculated from 11:00 a.m. to 11:00 a.m. irrespective of the time of admission. If the discharge is delayed beyond 11:00 a.m. till 3:00 p.m. the patient is charged half day's bed charges for the day. 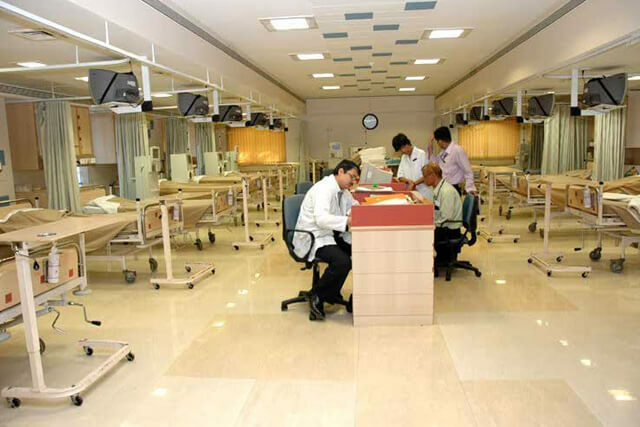 P. D. Hinduja Hospital, in its endeavour for providing excellent quality health care for all, now extends its bed capacity in patient care services by additional 33 beds in Median Category. These beds are located on the 1st and 2nd Floor of Lalita Girdhar building behind Hinduja Clinic. The entire facility is centrally air-conditioned. 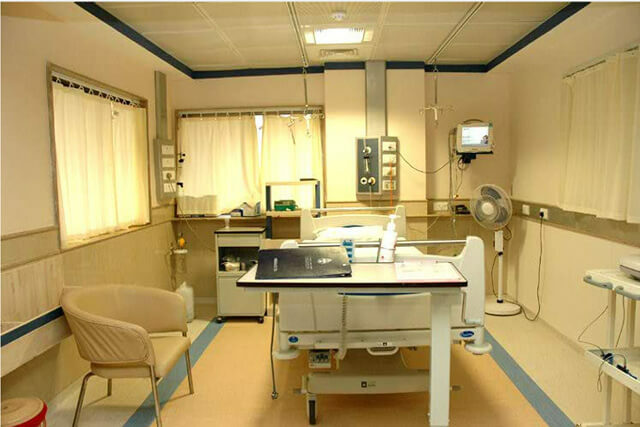 Every floor has one procedure room equipped with advanced monitors and surgical instrumentation. Dedicated Clinical, Nursing and Support services available round the clock working towards providing quality patient care, create an environment ideal for speedy patient recovery. The hospital kitchen is equipped to serve well balanced vegetarian meals. Special diets, will be served as prescribed. All meals are planned and their preparation supervised by trained and competent dieticians. 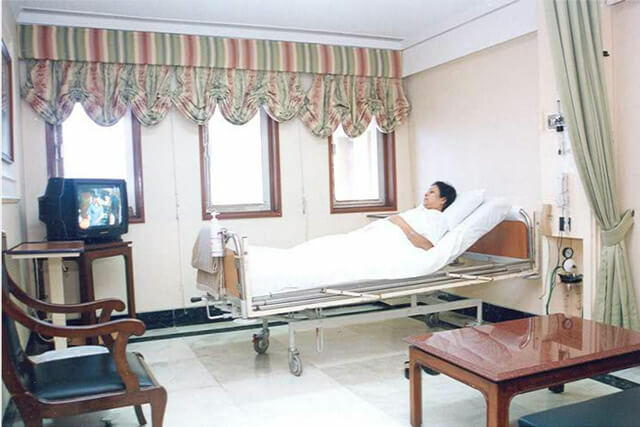 Meals are not served to visitors but meals for patient's attendants can be arranged. Such meals are charged for separately.Request for attendant's meal should be made to the nurse, on arrival. Consumption of alcohol, smoking, chewing gum and spitting is prohibited. A hygienic environment is essential for your health, help us to maintain our standard. Keep the toilets clean & dry. Use the dustbins for disposal of any waste. We take pride in serving you. Giving tips is prohibited. 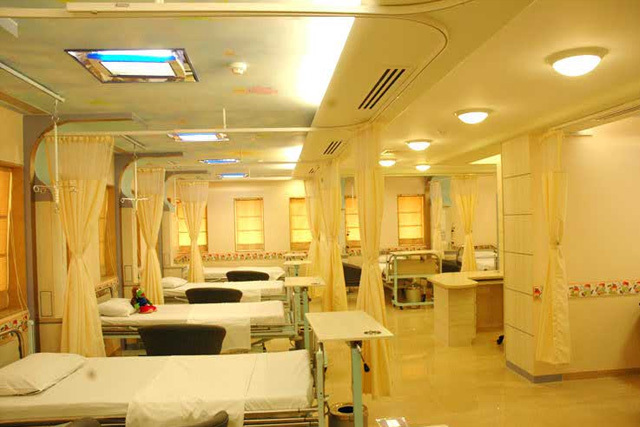 Attendants of median class patients may collect Bed Sheets from 9th floor West Wing from 10am - 12pm & 8pm - 9pm. These are to be returned at the time of discharge or a charge will be levied. It is mandatory that patients wear hospital clothes. 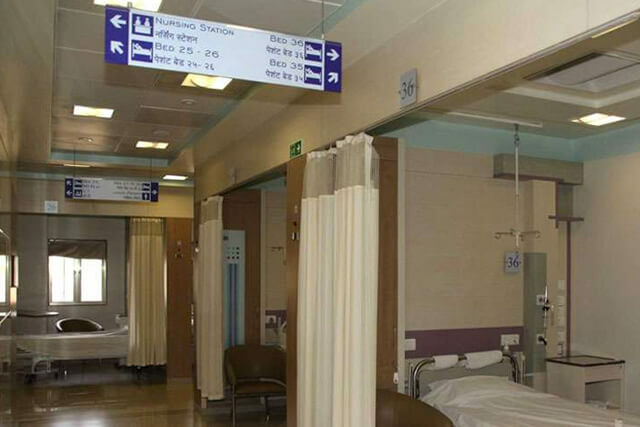 For any additional requirement of linen, you may contact the ward nurse. The hospital has its in-house laundry where the clothes & linen are washed and sterilised. In case of any electrical defaults with the light, switches, A/C or any electrical items, contact the nurse on duty for assistance. Do not attempt to shift or repair any electrical item. Do not touch the oxygen & suction pump equipment. Do not change the setting of the thermostat knobs. To maintain the temperature in the rooms, do not open any windows as it affects the air conditioning. Music and television facilities are provided in Suite by the bedside. Television sets are tuned to receive various satellite channels between 7.30 am & 10.30p.m. Please do not change the settings. In case of any inconvenience, please contact the sister incharge of the wards. The PRD is located on the ground floor next to the bank. It facilitates patients to avail the benefits of charity based on economic criteria and affordability. It also acts as a grievance redressal cell of the hospital. In case you have any feedback, appreciation, complaint, you may contact the department. The hospital provides laboratory collection services for all lab investigations at your home. To avail this service contact the home sample collection service for prior booking between 8am - 8pm on 95250-2336835, Mobile: 3250 4941 or Pager: 9628- 260158. The reports will be sent by courier to the address given. The reports of all lab investigations can be sent to you by courier, on request. The hospital provides home care services for specialized nursing care. To avail the service call 9821477322 / 9920299092 to get a suitable appointment.